Today the Center for Popular Democracy joins with its partners in the New York City Paid Sick Days Coalition to announce a historic agreement to give over one million New Yorkers the right to take a paid day off from work to care for themselves or a sick family member. The proposed new law, due to be enacted by New York City Council, is the product of a four-year campaign involving dozens of organizations and thousands of supporters. The law represents a major step forward for workers’ rights in the United States. Without this law, over a million workers – especially low-wage workers – were forced to choose between their own health, or the health of their family members, and a job. In addition to extending critical protections to New York City’s working families, the law addresses a serious public health problem. Without sick leave, many workers had no choice but to go to work sick – exposing co-workers, clients, fellow commuters, and others to disease. The new law, which will take effect in April, 2014, will guarantee paid sick leave for workers in New York City who work at employers with 20 or more employees. That threshold will be reduced to 15 employees in October, 2015. The law will provide unpaid sick leave to all other workers so that, although they are not legally entitled to be paid for the time they take off, they may do so with a guarantee that they cannot be fired. CPD would like to thank our partner organizations for their tireless efforts over the four year campaign. 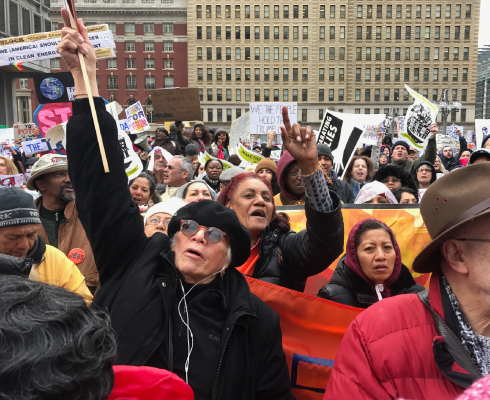 The Center for Popular Democracy and Make the Road New York were joined by NYC City Council’s Progressive Caucus, the Working Families Party, 32 BJ SEIU, A Better Balance, New York Communities for Change and the NY Paid Sick Leave Coalition. The fight for paid sick days in New York City exemplifies CPD’s commitment to building strong coalitions of membership-based community organizations, progressive unions, policy advocates, and elected officials to advance a pro-worker, pro-immigrant, racial justice agenda in cities and states across the country.